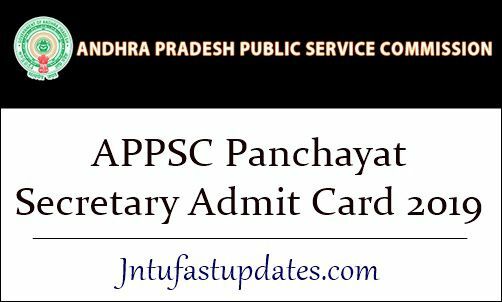 APPSC Panchayat Secretary Admit Card 2019: Andhra Pradesh Public Service Commission (APPSC) scheduled the Panchayat Secretary (Group 3) examination on 21st April 2019. The APPSC Panchayat secretary examination will be hosted in a large number of examination centers across the state. All the competitors who have cleared the preliminary examination can get ready for the mains examination. As the competitors know, the hall ticket is the key document to carry to the examination. All the hopefuls who have competed for the panchayat secretary prelims examination and qualified the exam with required marks are eligible for the mains examination. APPSC is shortly expected to release the panchayat secretary hall ticket on its official website, psc.ap.gov.in. All the competitors who are going to attend the examination on 21st April can get ready to download the hall tickets as soon as the hall ticket link is activated. More details such as downloading process, hall ticket availability date, guidelines for the examination, and other details mentioned in this article. Andhra Pradesh Public Service Commission (APPSC) is the state government organization that releases various recruitment notifications every year to recruit suitable candidates into various government jobs. Recently, the APPSC notified 1650 Panchayat Secretary Group 3 posts. A large number of aspirants aspiring to get state government jobs in AP state have applied for the announced posts from 27th December 2018 to 18th January 2019. Candidates will be shortlisted through preliminary examination (pen-paper based), examination (computer-based test), and interview rounds. Aspirants need to qualify each and every round with good merit to finally get shortlisted for the announced posts. All the hopefuls who have cleared the prelims examination can get ready for the examination, which is going to be conducted on 21st April. Candidates waiting for the hall ticket must wait for few more days. Soon, the hall ticket link will be activated on the APPSC website, psc.ap.gov.in. The hall ticket link will be activated before 1 week or 10 days of the examination. Hence the competitors can get ready to download the hall tickets for Group III examination. After downloading the hall tickets, check the information which is printed on it. ap.gov.in is the APPSC official portal; from which the admit card can be accessible to download. After visiting the above page, search for the admit card download link for Panchayat Secretary examination. Click on the link and furnish the required login credentials correctly to download the admit card. Tap on the submit button over there. That’s it! The admit card/call ticket gets downloaded. Check all the details from it and take a printout to carry it to the examination. 15 April is the date given in website to download the admit card, exam is likely to be postponed. hello sir,my name is dilli i applied group 3 exams lost 2 days i try to download admit card but i cannot download its showing empty page,how can i download my admit card please help me.